Solid and stranded:Solid wire consists of one piece of metal wire. Stranded wire is composed of a bundle of thinner wires. Choose the same type of plug as the wire you are using. 6, 30, and 50 micron: Thickness of gold plating on contacts. The thicker, the better protection against corrosion and aging. 50 micron has the best protection. While 6 micron is fine in office environment, we recommend 30 or 50 micron in dusty or chemical environment. Our patch cables are using 50 micron highest grade. 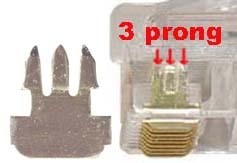 2 prong and 3 prong: When the plug is crimped, the contacts bite the wire like vampire. 2 Prong is 2 teeth so to speak, and 3 prong , 3 teeth. 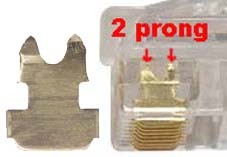 3 prong has better bite (secure contact). Our highest grade is 50 micron, 3 prong. This product was last modified in our catalog on Wednesday 15 June, 2011.